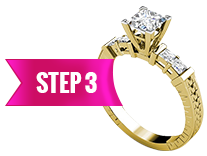 Use our easy three part form to begin the magic of creating your own, custom designed ring. Fill in your Contact Information, Ring Information, Upload Images, and add any Notes - click Submit, and one of our design team reps will be in touch within 48 hours. How to fill this form? At PrimeStyle you’ll find custom rings that you can personalize for any occasion at wholesale prices. If you’re looking to ask your special someone for her hand in marriage, do it with a ring that is as unique as she is. At PrimeStyle, we make the process of creating custom rings quick and affordable - so you can easily design and deliver the perfect engagement ring to your bride-to-be. Simply complete our easy three-part form to start the customization process. 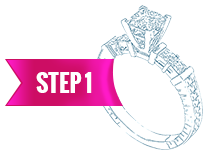 We’ll gather information from you - including your contact information and any personal notes you may have, then we’ll get to work designing your custom ring. Simply specify your desired metal, center stone shape and price range, and then upload any images you might have that accurately convey your wishes. One of our dedicated design reps will be in touch within 24-48 hours to walk you through the process and ensure we understand exactly what you’re looking for. We’ll send you a design rendering quickly, so you can approve it or provide us with any notes or modification requests. Then, we’ll create your custom jewelry, polish it up for delivery, and send it right to your front door in a matter of days. Enjoy incredibly low prices, free shipping, and our 100% authentic diamonds, too! 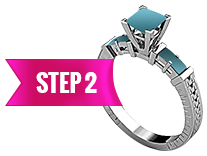 We invite you to explore the option of creating a custom ring - it’s easier and more affordable than ever at PrimeStyle!